Samsung’s Galaxy S8 is easily one of the best smartphones you can buy right now. The design is incredible, the camera is among the best you’ll find, and the software is great too. As far as battery life goes, it’s not bad for an Android phone but it still won’t last a full day of heavy usage. If you want to double your battery life, check out the Maxboost Atomic Power Galaxy S8 Battery Case. It has a 4.7-star rating on Amazon and it’s on sale for just $38 right now. 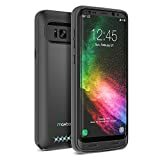 * Durable Design – Protects your Galaxy S8 from scratches and wear and tear due to 360 degree comprehensive bumper design and hard-shell backplate. * Lifetime Warranty – Guaranteed lifetime warranty by Maxboost for your Galaxy S8 battery case.